Well the weather isn't looking great tomorrow, but we should be able to get in the morning ride. On Friday, May 30th - Forge Pond Beach, Westford. The Morning Fitness Ride will ride around a bunch of ponds and stop by the Stone Arch Bridge. Route Map - Westford - Cow Pond - Stone Arch. Unpaved - 2 miles mostly smooth. LUNCH is at Pizzeria Presti. The Afternoon Recreation Ride will go to Nabnassett Pond and visit East Boston Camps on the way. Route Map - Westford - Nabnassett. Unpaved - a bit of smooth dirt. AR Index - Roughly equal to 16 flat, paved miles. I have to go to Bar Harbor this week to keep the contractors on track. There is no ride on Monday since it's Memorial Day. On Wednesday, it's another DIY ride unless you want to come to Bar Harbor. I'll work on something closer since the weather is looking pretty good. On Friday we will attempt the Westford ride again. On Monday, May 26th - Memorial Day. 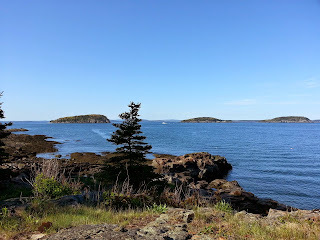 On Wednesday, May 28th - Bar Harbor. 9:30 AM - We will leave for Acadia National Park. Starting Point Map - 8 Barberry Lane, Bar Harbor, Maine. Route Map - Bar Harbor - Jordan Pond..
Off Road - 10 miles - mostly smooth. 12:30 PM - LUNCH at Jordan Pond House. 3:00 PM - We will be back to Bar Harbor. On Friday, May 23rd - Forge Pond Beach, Westford. It looks like a beauty. It looks like the weather gods will smile on us tomorrow! I suspect it will be much like the last couple of days with sunshine in the morning and partly cloudy in the afternoon. There could be a seabreeze cross wind in the afternoon, but I know how to deal with that. The only glitch is that the Sagamore Creek Bridge on Route 1A is closed, so we will need to go back to New Castle after lunch adding a couple of miles to the ride. RSVP if you want help setting up carpools. NOTE: We want to LEAVE Hampton North Beach at 9:30 because I need to get back to Groton in time to drive my son to Barre (an hour in the other direction). 9:30 AM - We will leave for Newcastle and Portsmouth. I hope you all got out to enjoy this spectacularly nice day. Tomorrow is supposed to be similar except even nicer. The Senior Center, to the right of our Starting Point, is open on Mondays, so we will have porcelain! For LUNCH we will have a picnic to the left of the Starting Point at the Teen Center. We can get food at the Village Grill. The morning Recreation Ride will go to Lake Whalom and then to Lake Shirley. Then its off to see the alpacas on the way back. The afternoon Fitness Ride will tackle Pearl Hill before a hugely fun downhill to the State Park. Then a nice smooth flat run back to Lunenburg. The Spring 2014 season is more than half over, so it is time to start scheduling the Portsmouth ride. The weather doesn't look great this week, but we'll find something closer if the weather is lousy, but not too lousy. AR Index - Roughly equal to TBD flat, paved miles. The morning FITNESS Ride will visit the Acton Arboretum which should have a bunch of flowers. We will then go and ride a bit of the unpaved Assebet River Rail Trail. Lunch will be from Idylwilde Farm, hopefully at the outside picnic tables. The afternoon RECREATION ride will visit the llamas before riding around Long Pond. We will take the "easy" way up Nagog Hill before a fast ride down and back to Elm Street Playground. The weather is looking worse than it was this morning with a 30% chance of rain tomorrow afternoon but at least it will be warm. As usual, I will make the STOP / GO call before 8:00 tomorrow morning. Route Map - Acton Arboretum. Unpaved - a mile of so. LUNCH is at Idylwilde Farm in West Acton. Route Map - Acton - Littleton - Nagog. The weather looks OK, maybe an early sprinkle. The route is pretty simple too. Bring a map, or just wing it. The weather tomorrow at the coast is forecast to be cloudy, and very chilly, with an onshore headwind in the afternoon. Not worth the drive in my book. The weather is supposed to be better inland, although still cloudy. So, how about a ride from Groton Center to Hollis via West Groton and lunch at Hollis Country Kitchen. Then it's a straight shot down freshly paved Route 122 to Pepperell and we can take either Nashua Road or the Rail Trail back to Groton. I hope you all got out to enjoy this spectacularly nice day. Tomorrow is supposed to be similar except cloudier. So, the Harvard Apple Blossom Festival was yesterday and it was so beautiful that I scheduled another Harvard ride for Monday. Its always hilly in Harvard and the 2 new rides for Monday are no exception, but I tried to maximize the scenery and minimize the climbing. The morning Recreation Ride will go over the hill to Delaney Pond and back. Remember, for every uphill there is a corresponding downhill. The afternoon Fitness Ride will tackle Vaugh Hill Road in Bolton after a breezy run downhill through Still River. The Starting Point is still near Town Hall, but it is open on Monday's so please park away from Town Hall but around the common. Starting Point Map - Harvard Center - Town Hall. Route Map - Harvard Center - Delaney Pond. Elevation Gain - 400 feet. LUNCH is at Harvard General Store. Route Map - Harvard Center - Bolton. The Spring 2014 season is somewhere around half over, so it is time to start scheduling the Portsmouth ride. The weather doesn't look great this week, but we'll find something closer if the weather is lousy, but not too lousy. Anyhow, the weather is looking iffy with a 50% chance of rain tomorrow afternoon and kind of chilly. As usual, I will make the STOP / GO call before 8:00 tomorrow morning. Happy Cinco de Mayo! We will be celebrating tomorrow by having lunch at El Colima in Downtown Nashua. Since driving / parking in Downtown Nashua is a pain, we will be stopping for lunch before we get back to the starting point. Since it is only 1.3 miles back to the starting point, I will take non-lunchers back and pick up any lunchers at 11:30 AM at the Starting Point. I haven't figured out the routes yet, I'm busy with the pipe organ, but there is a bunch of new stuff to explore in the park. The starting point takes a bit of explanation. It is just off Exit 5A (Simon Street) from Route 3 North. If you are coming north on Route 3, get off at exit 5 but DON'T take 5E or 5W. Wait for 5A. If you are coming East on 111 from Pepperell, take the Route 3 North Entrance and get off almost immediately on Exit 5A. Take a left at the stop sign and bear left onto Whipple Street. PortaPotty Equipped! The Morning Recreation Ride will explore Mine Falls Park in Nashua, NH. We should be back by 11:30 AM. or 12:30 if you stop for lunch. Starting Point Map - Exit 5A off Route 3 - PortaPotty equipped. Unpaved - a bunch of smooth dirt. AR Index = roughly equal to TBD flat, smooth miles. 11:15 AM - Lunch will be at El Colima in Downtown Nashua. The Afternoon Fitness Ride will also explore Mine Falls Park in Nashua, NH. I just wanted to send out a quick note of what I am planning for next week. More information will follow. I'm up to my knees in saw dust right now helping my son Milo get his homemade pipe organ ready for his Senior Project Exhibition. He does all the work, and I just stand around asking stupid questions. I have to help him setup on Wednesday and Carole has an important meeting, so the Wednesday Ride is DIY. Everybody is invited to Parker Charter School in Devens to learn everything there is to know about pipe organs. Milo's exhibit is Thursday May 8th at 10:55 AM. Just sign in at the main office and proceed to the Lunch-atorium. Turn left from the office and follow the hall to some big doors on the left. The building is an abandoned Army elementary school, and the dress code is "yes, please". We will meet at Mine Falls Park in Nashua. I'm not quite sure how this is going to work, but I want to have Cinco de Mayo Lunch at El Colima in Downtown Nashua. If anyone wants to be a volunteer "Fearless Leader", let me know and I can give you route ideas and mailing list access. Here is a time lapse video of part of the building process. Each second captures 48 minutes of real time. Not the track or the soccer field, but right by Town Hall (Closed on Friday). After all this rain, tomorrow is looking REALLY nice. It should be Mostly Sunny, 60s, and breezy. We will go to Harvard General Store for LUNCH and if it's nice enough, we can have a picnic. The morning Fitness Ride will visit the "Lollipop" Cemetery and the old Shaker Village before climbing Oak Hill for a GREAT roller coaster ride back to Harvard. LUNCH will be at Harvard General Store. The afternoon Recreation Ride will climb Prospect Hill before riding around Bare Hill Pond and hopefully not getting throw out of Town Beach. Route Map - Harvard Center - Rollercoaster. Elevation Gain - 500 feet and 1 category 5 hill. Route Map - Harvard Center - Bare Hill Pond. Elevation Gain - 300 feet, 1 Category 5 (easiest) hill. Unpaved - 1 mile smooth dirt. AR Index - Roughly equal to 13 flat, paved miles.